Factory sealed from the 1970's, but with imperfections (rips/openings) in outer plastic. Will be VERY carefully packed AND insured. Please examine photos, ask questions. 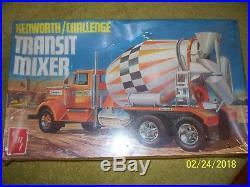 The item "Vintage 1/25 AMT Kenworth Challenge Transit Mixer, sealed" is in sale since Wednesday, October 24, 2018. This item is in the category "Toys & Hobbies\Models & Kits\Automotive\Truck". The seller is "collectiongottago" and is located in Marietta, Ohio.